And don’t they look lovely in my kitchen? 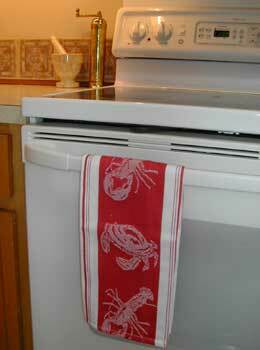 Thank you, Andrea, for thinking of me and sending this awesome crab and lobster towel. You’re a sweetie! Not only am I a crab collector, but I’m a huge dishcloth fan. A girl can never have too many! Hmmm, I thought of you again when I saw this Crochet Tomato Pincushion! I just saw these 2 minutes ago and thought of you immediately! A crocheted crab pattern and a crocheted lobster pattern! It does look absolutly lovely! Very thoughtful of Andrea!